The main material used in shoes is cloth and rubber. Uppers are added sequins. You have a pair of shoes and a USB charging cable in the package you purchased. When received the shoe and found the shoes light is not lit, please charge your shoes battery,when charging,slowly pull the plug and note the front and back of the connector. Shoes can provide 11 different colors and more fun,more simple and convenient,if not used for a long time,need to first open the lights through the hidden button before they can use. 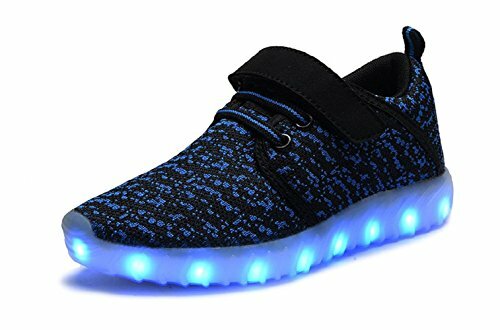 Each pair of our LED shoes has been subject to strict quality inspection, but can not ensure the damage in transit,If you receive a defective product,as long as you give us a chance to help solve your problem,Thanks in advance! High-quality cloth, breathable, wear-resistant rubber soles, colorful LED light, which is give to children surprise gift. Charging Tip: You can connect a USB cable from the computer,you can also use mobile phones and other chargers, mobile power can also be used,safe and reliable. PACKAGE INCLUDES ：1 pair shoe laces(shoes not included), each lace has 10 lights and two CR2032 battery .Durable and bright. It is easy to open the battery case to replace it. WELL-ADDAPED : Suitable for any kinds of Shoes, including running shoes, boots and skates.Comfortable for kids or Adults. Size: 0.4''*43.3''/1.0*110 cm, weight for one pair:1.2 OZ/ 33g. LIGHTING the NIGHT & EYE-CATCHING : Great for Hip-hop Dancing,night sports, night jogging,night activities, weddings, parties like birthdays party, Mardi Gras Party, Halloween party, dance party, Raves & Celebrations, Christmas, outdoor events,holidays ,and for safety and all kinds of night time fun!. Great toys for kids party supplies, Easter Basket Stuffers, school classroom rewards, Easter Party.